In space, no one can hear you scream – or so they say. Chances are whatever enemies you choose to make in Space Tyrant will be screaming plenty, as they feel the wrath of an absolutely ridiculous army. One so powerful it just might be enough to conquer an entire galaxy! Muahahaha. I mean, what good is war if you’re not on the winning side? Not that it’s a guarantee in this case, but if you play your cards right – maybe? Also, 5X, because 4 is not enough. Or something. Tagged as a “zero-attention span mega-empire builder” by Blue Wizard Digital (Slayaway Camp), Space Tyrant sounds like a less-than-serious tactical affair, which I suppose is a welcome addition, given how crowded the 4X market has become. Yes, even if they did tag on that extra X – which stands for eXsanguinate, in case you’re wondering. I know I was at least. Clever. Real clever. Hours upon hours of space strategy delivered steaming-hot into your gaping tentacular maw-orifice, the way you demanded it! Oh, and they go on to emphasize how there will be no cultural victories, or even diplomacy. Which means… war is finally going to be good for something. Including the slaughtering of entire races, no doubt, as you move from one planet to another, pillaging it for precious space cards. Cards which may or may not turn the tide of battle during future encounters. But while taking over, well, absolutely everything as a Space Tyrant (which, incidentally, is also the name of the game) sounds like a fun time to me, mention has to be made of how the game is currently in Early Access – and will be for a while, it seems. That said, its creator does claim that the game is currently “surprisingly stable and there are many hours of game-play available”, which is more than the majority of Early Access launches can even begin to claim. As for exactly how stable it is – who knows? One way to find out. Just remember that Early Access has ‘early’ in it for a reason. 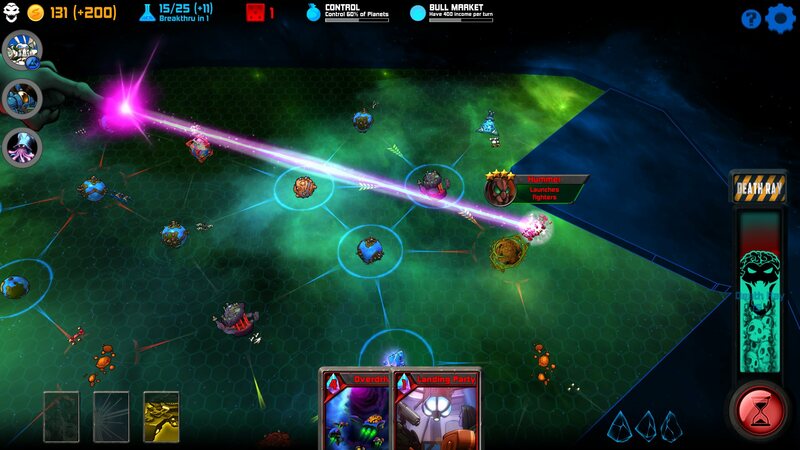 Space Tyrant [Early Access] is available from Steam, carrying a $19.99 price tag.